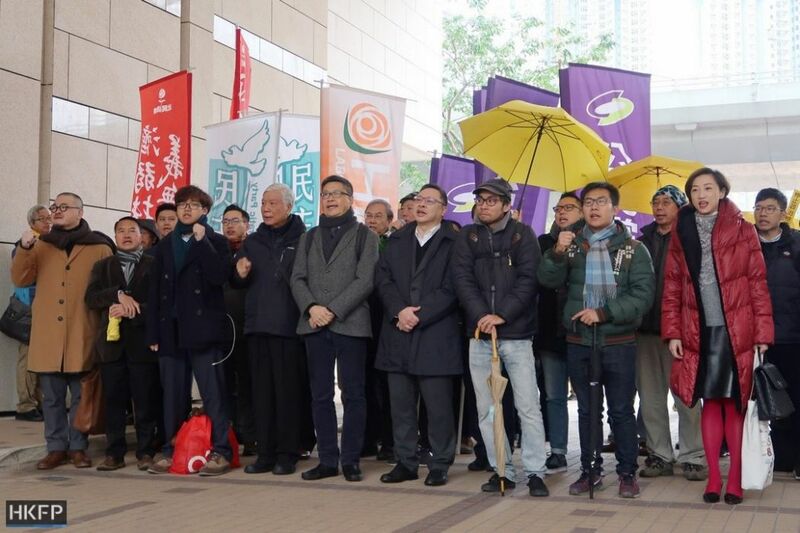 Lawyers acting for nine leaders of the 2014 pro-democracy Umbrella Movement protests have said that their public nuisance charges were “unconstitutional” and “unnecessarily” formulated to increase pressure on them. 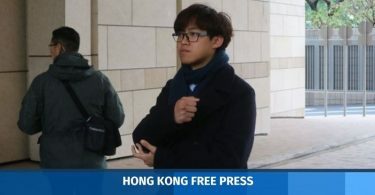 “The prosecution overloaded the charge sheet, unnecessarily and artificially bringing the charges to increase pressure on the defendants,” Senior Counsel Gerard McCoy, who acts for Occupy co-founders Benny Tai, Chan Kin-man and Reverend Chu Yiu-ming, told the court at a pre-trial review on Tuesday. The nine defendants outside the court. Photo: HKFP. Though the case is being handled by the District Court, the hearing took place at a larger venue at the West Kowloon Magistrates’ Courts to accommodate the large number of defendants and observers. The defendants are facing charges of inciting others to create a public nuisance, and inciting others to incite more people to create a public nuisance. The three co-founders face an additional charge of conspiring to create a public nuisance. Each charge carries a maximum penalty of seven years behind bars. McCoy said the use of double inchoate offences – in this case, incitement to incite – is unconstitutional on the basis that the alleged offence is not prescribed by the law, and that it goes against the rationale of criminal justice to punish completed crimes or acts that closely preceded them. “They are looking for some form of consecutive sentence. There is no other rationale for them to do this unless they are seeking to maximise the punishment to be inflicted on the defendants,” McCoy said. The defence team asked Judge Johnny Chan to consider quashing the double inchoate charge. McCoy further argued that the proper charge should be conspiracy to commit the lesser offence of unauthorised assembly. Tuesday’s hearing focused on a key element of the conspiracy charge – the three co-founders had planned with “other persons” to commit a public nuisance. The prosecution said the other people referred to “teams of pickets, volunteers and supporters” of the Occupy movement, but they said that they could not name anyone belonging to such a category of people. The defence said the lack of precision and identification of individuals made it difficult to defend their case. They also voiced concern that the uncertainty would prevent former supporters from coming forward to testify in court for fear of self-incrimination. “Around 1.2 million people visited the Occupy sites, but only nine of us have been charged. The prosecution needs to explain their decision,” Chan Kin-man said outside the court following Tuesday’s hearing. Chu Yiu-ming, Chan Kin-man and Benny Tai. Photo: Ellie Ng/HKFP. More than 1,000 people were arrested in relation to Occupy, the court heard. 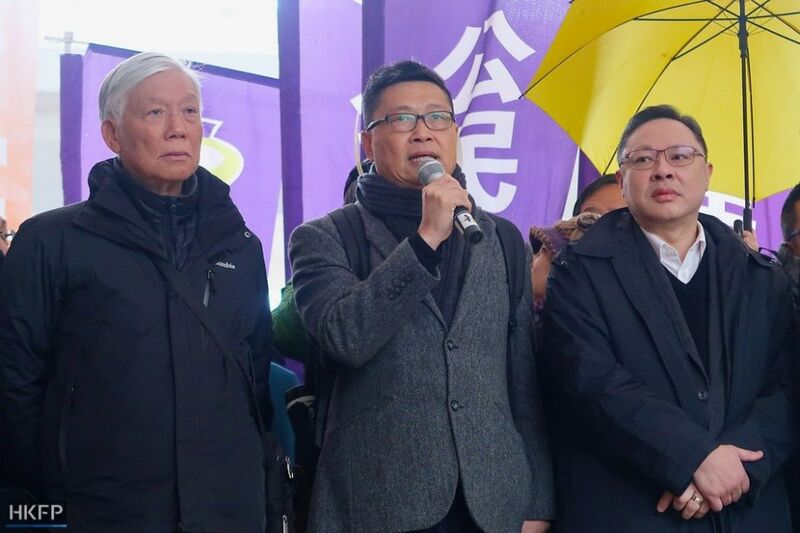 Judge Chan was also asked to consider trying Raphael Wong of the League of Social Democrats and former Democratic Party lawmaker Lee Wing-tat separately from the rest of the group. Lee faces only one count of inciting others to create a public nuisance, while the cases of Lee and Wong referred to incidents that took place at a different time and location compared to those of the other defendants. 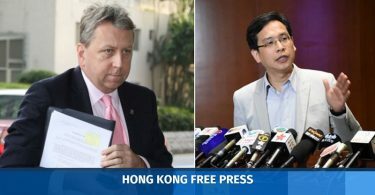 Lee’s lawyer Edwin Choy said that the prosecution was “clearly trying to contaminate the situation” of his client by associating him with events that he was not even being charged with. The defendants previously wanted to be tried at the High Court instead, so that the case would be put before a jury. The pre-trial review continues on Wednesday. It is scheduled to last for four days.